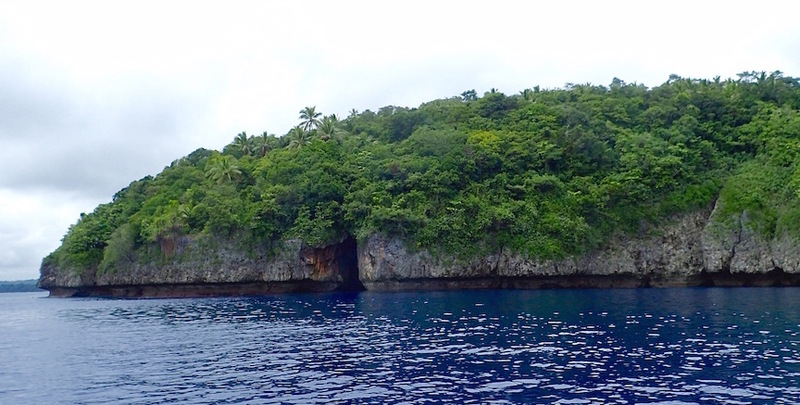 View of Swallow’s Cave from a distance, on Kapa island, Tonga’s Vava’u group. Port Maurielle is the closest anchorage. Port Maurielle off Tonga’s Kapa island waters gleam sapphire when the sun is shining. The sun was a tease when we anchored there, too fleeting for good photos. At a mere 6.5 miles from Neiafu, Port Maurielle is one of the closest anchorages and most visited in Vava’u. 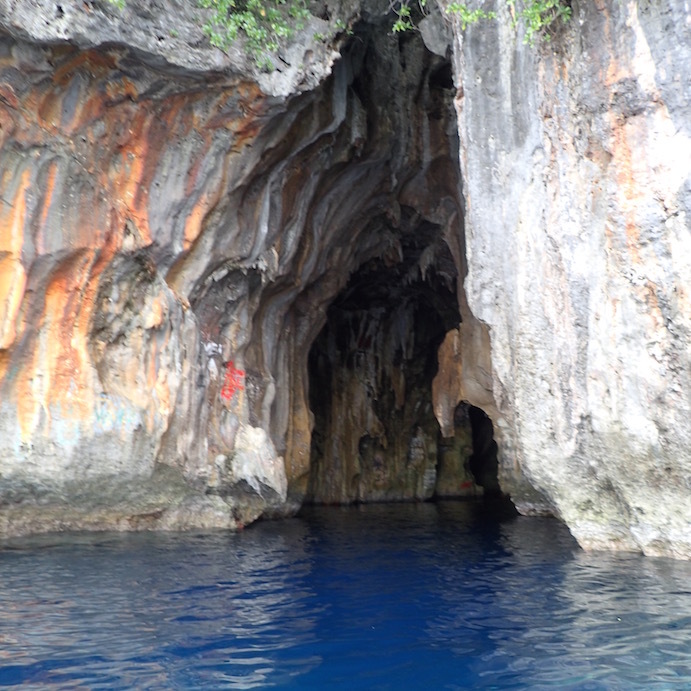 Aside from proximity, Swallow’s Cave is Port Maurielle’s big draw, considered a “must-do” for Vava’u visitors. Starlings inhabit the cave, though it’s called Swallow’s Cave. 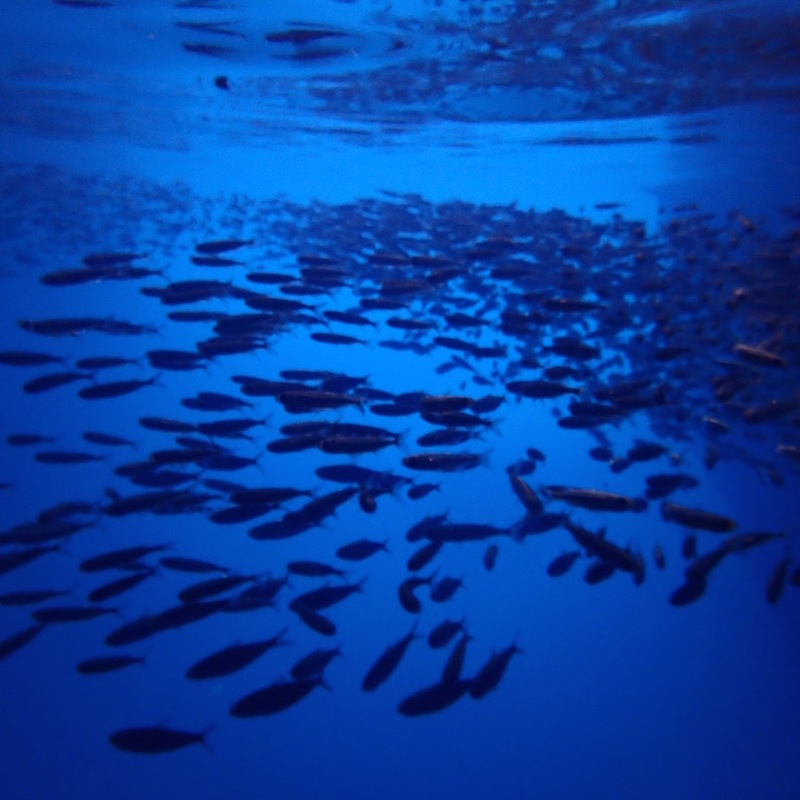 to its vivid watery blue “floor.” Kapa island, Vava’u, Tonga. 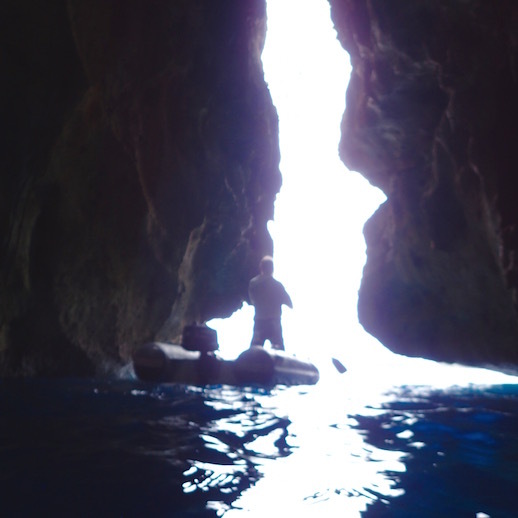 On a slow 5-horse dinghy motor like ours, Swallow’s Cave’s only about a 10 minute ride from the anchorage to the cave. The cave’s floor is entered by dinghy or swimming; its “floor” plunges deeply down into the water. consider it historical. Kapa island, Vava’u, Tonga. 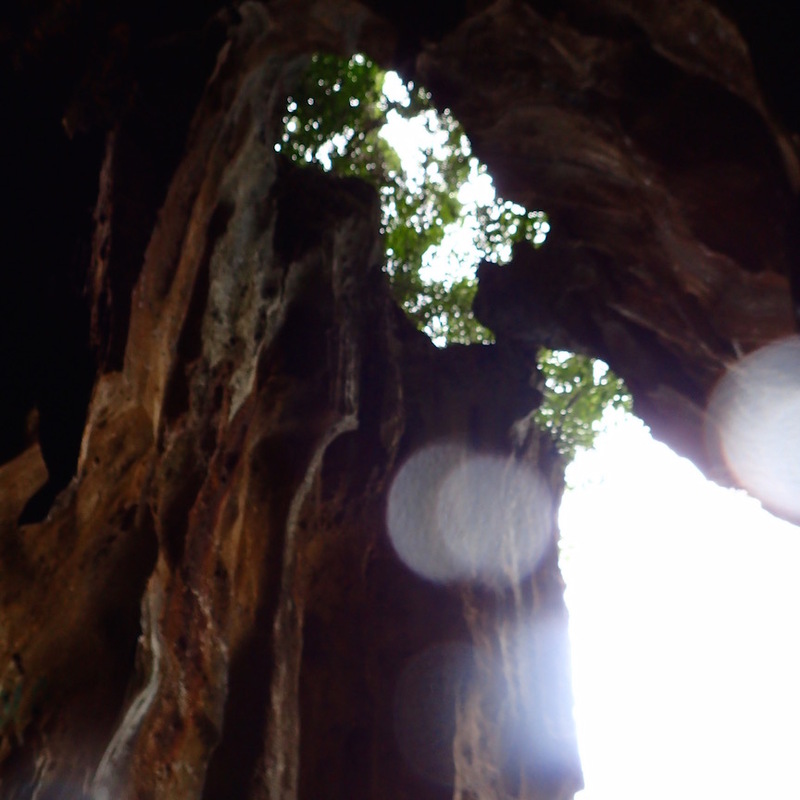 A sunny late afternoon is considered optimal conditions for visiting the cave; we figured one out of two ain’t bad. Indeed, even in the heavy overcast, Swallow Cave’s colors still really pop. The water outside and inside the cave is a deep Tidy-Bowl blue. Just inside the cave’s arched opening is a brilliant ferrous flame- orange rock. Deeper inside, the graffiti-covered interior rock arches practically glow with a neon green hue. 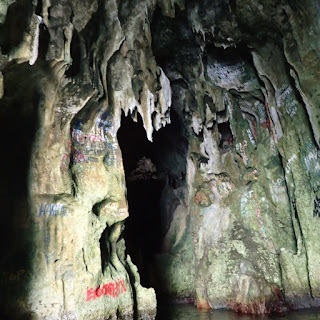 Swallow’s Cave waters. Kapa island, Vava’u, Tonga. 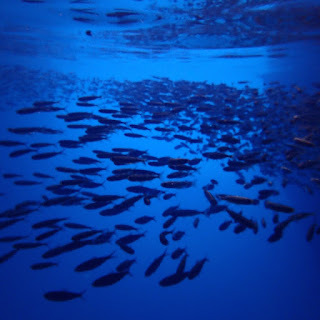 A dip in the cave’s cool waters flickered from a large, fast-moving school of small, silvery fish with a thin, electric blue stripe running horizontally across their bodies. 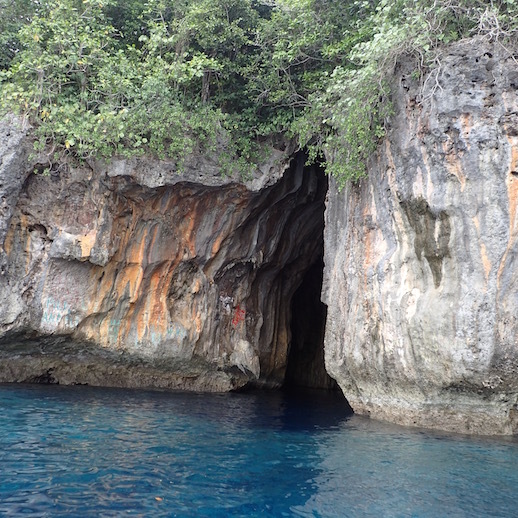 The fish were the only marine life I saw in the cave – no other kinds of fish, no sea urchins, no starfish, no coral. We found Swallow’s Cave definitely worth the stop at Port Maurelle. 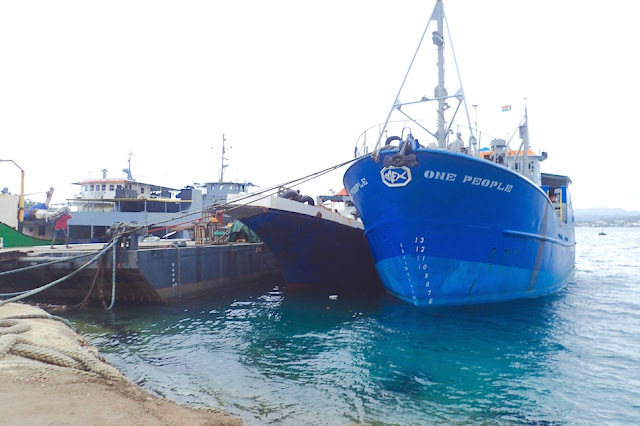 for the ride back to Port Maurelle, Kapa island, Vava’u,Tonga. 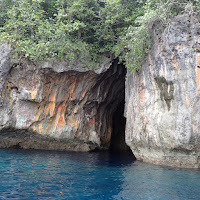 This post is a recent retrospective of our stop in Port Maurelle, Kingdom of TONGA (S18.42.024 W174.01.801) Vava’u island group, where we’re currently cruising. It was written while we anchored in nearby Hunga Lagoon (S18.42.066 W174.07.551). Amazingly, there is wifi here, for $2.50/hour USD from Barry & Cindy of Hunga Haven. You do have to anchor or grab a mooring ball close enough to get the signal, though, even with an antennae. food for parties in the days of yore. 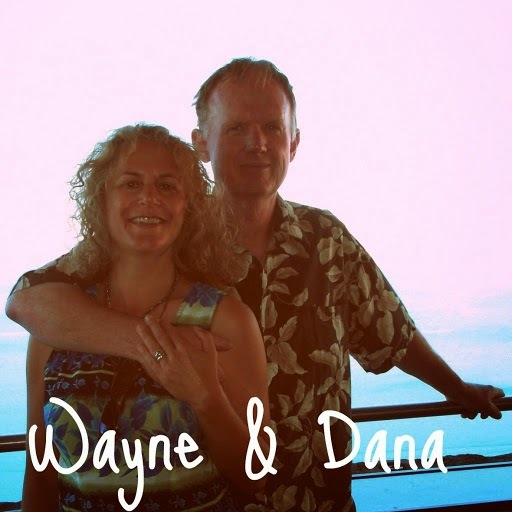 As of our start, December 7th 2014, from Jacksonville FL NAS, USA until our current travels around in Tonga’s Vava’u group -- ~10 months, we’ve spent about a third of our time --123 days -- sailing and covered 8,733 nautical miles. The prior 2 years combined, we sailed 3762 miles. By the time we arrive in New Zealand in November, less than a year from when we set out, we expect we’ll sail over 10,000 miles this year. That’s a lot of miles for a boat with a hull speed of 7 knots; we usually sail far slower than that.